Most people are familiar with the idea of a robot. But what makes a robot a robot, and not just another machine? In this step, we define some of the key characteristics of a robotic system. A key feature of robots is that they interact with the world, making changes to the world through their actions and responding to events in the world. Robots perform useful tasks, extend the capabilities of humans and reduce our risks when operating in hazardous environments. 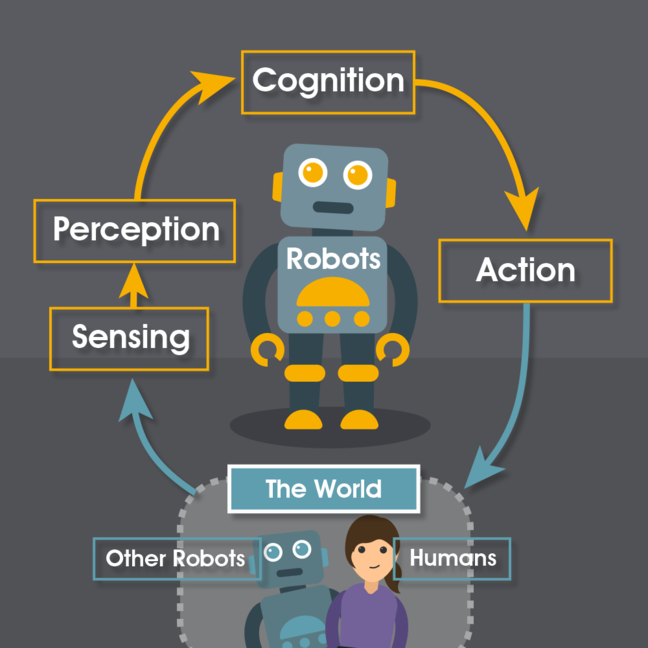 This ‘feedback loop’ of autonomous sensing, perception, cognition and action is what distinguishes the robot from other machines (see figure 1). A robot or autonomous system consists of the entity itself and its interaction with the world including other RAS and humans. The key elements of any RAS are the ability to sense and perceive the world, make intelligent decisions and take appropriate actions. 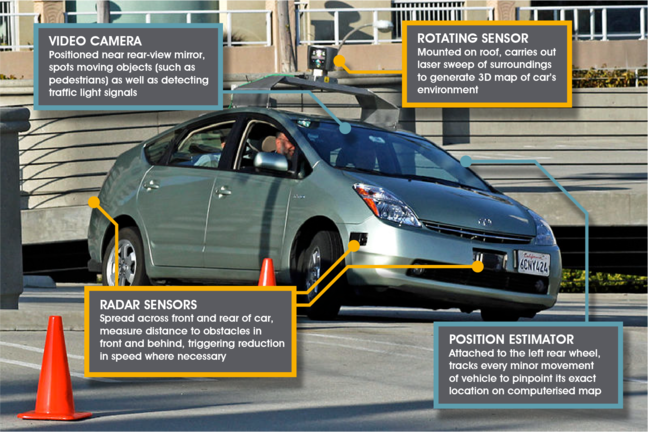 Sensors: the car has a number of sensors that allow it to perform autonomously, including LIDAR (light detection and ranging), video cameras, RADAR (radio detection and ranging), wheel encoders (which measure wheel rotation to estimate distance travelled) and GPS (global positioning system) which is used to measure the car’s location in the world. Perception: perception algorithms transform the raw data into labelled objects e.g. other cars, pedestrians and road signs. 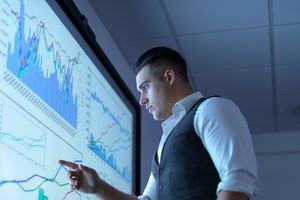 Cognition: cognition algorithms allow the car to plan actions based on current perceptions and goals (i.e. desired destination and route, avoiding obstacles). Action: the actions are implemented by low-level control algorithms that manipulate the steering wheel, accelerometer and brake to move the car, and which take account of the vehicle dynamics, road surface and environmental conditions. For robots to make an impact on human society in future, they need to be able to operate safely and effectively amongst humans. Most conventional robots operate successfully in structured environments such as factories. These are controlled spaces where the general public are not allowed to venture, or only under supervision. A key challenge for future robots therefore, to bring them out of the factories, is to make them more robust to unstructured environments, where the environment is unknown and unexpected events can occur. The challenges for robots in unstructured environments extend across all the robotic elements of sensing, perception, cognition and action. In each week of this course, we’ll focus on a particular area related to current research challenges that underpin the future of robotics. The focus of Week 1 is on sensing and perception, with an introduction to cognition and action using planning techniques such as primitive actions. 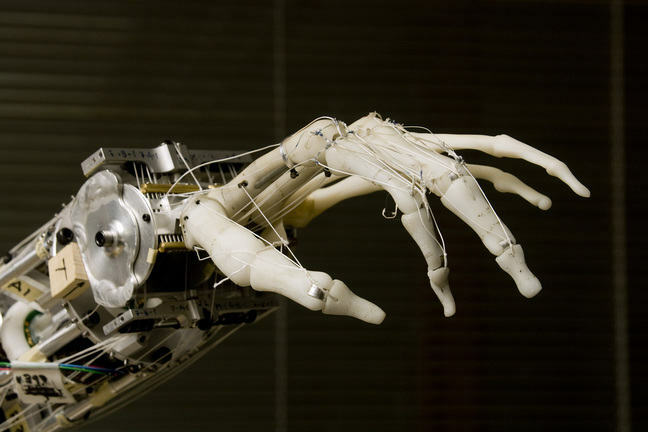 The focus of Week 2 is on bioinspired robotics, which links to cognition and aims to use design principles from the natural world to improve adaptability, versatility and robustness. The focus of Week 3 is on cooperative robotics, where robots combine in teams to solve problems collectively, and expands into ethical issues in robotics, as well as skills a robotics engineer will need in the future, such as computer programming.